The HoloTube is a new hologram projection display that creates a life sized holographic greeter or spokesperson in a minimal floor space footprint. Perfect for Trade Shows, Museums. A large interactive touch screen allows a vast choice of information and viewing options showcasing the clients product in great close up detail and in 360 degrees. 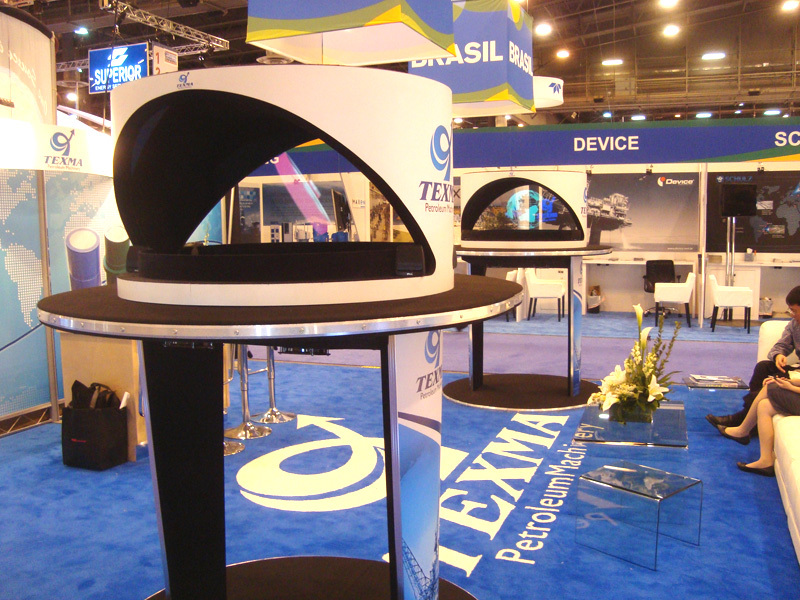 The high brightness projector system is designed work in bright trade show environments. Recently featured at 2018’s Oil Technologies Conference, the display proved to be a big hit with show attendees. For more information on HoloTube visit the Trade Show Holograms website online. 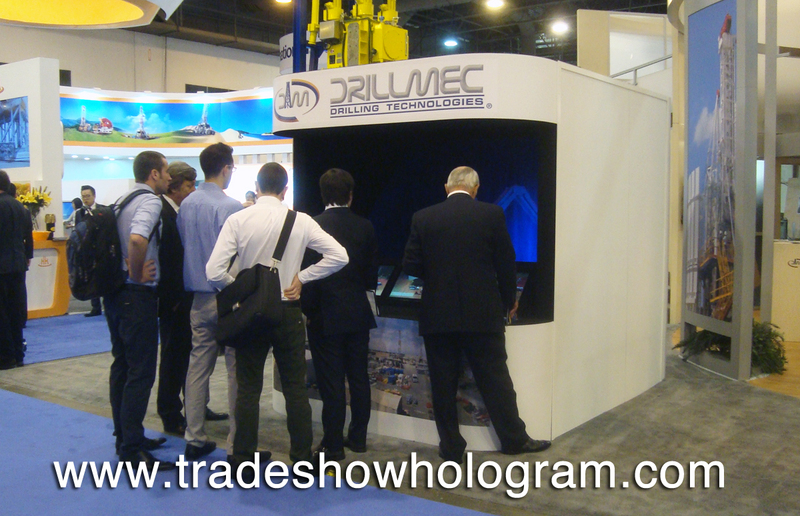 Large Sized 3D Hologram Projector draws attention at OTC 2014 Trade Show in Houston TX. After a successful showing in Milwaukee WI, this large sized hologram projector was shipped to Houston TX for the OTC 2014 where it proved to be just as popular with trade show attendees. The Holographic Kiosk projected a hologram 3 ft tall and 5 ft wide floating in mid air. Video monitors embedded in the front of the display showed more detailed video to maximize available information to the viewer. This Hologram Projector is the latest from Trade Show Holograms and is base on the earlier FIONA model. ( FIONA is a holographic robotic virtual greeter ) Trade Show Holograms has offered clients a wide range of designs and sizes of Hologram Projectors since 2007. The amazing displays are available for both rental and sale across the USA and Canada. Timothy Drake recently returned to the OTC Trade Show in Houston Texas to ramp things up a bit. A past client decided to bring a larger scale hologram to their booth based on the success of the hologram display they featured the year before. 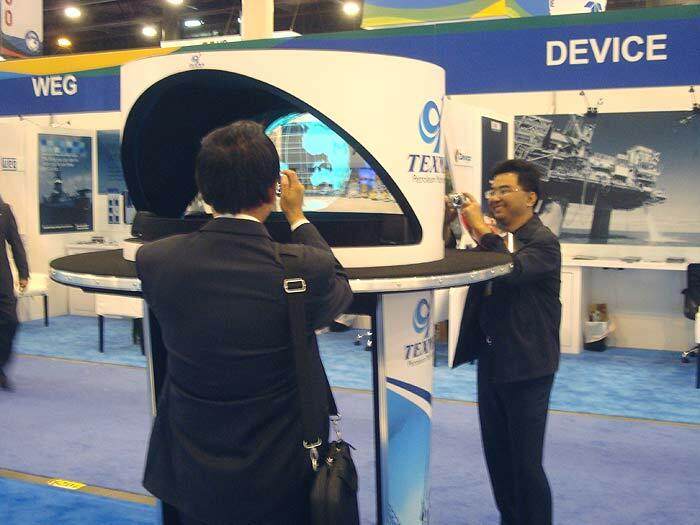 What is better than a holographic kiosk in your trade show booth at the OTC ( Oil Technologies Conference ) in Houston Texas? Well…TWO holographic displays at your booth of course. 😉 A recent Trade Show Hologram client decided two were better than one. OTC visitors taking photos of the Holographic Images at the OTC after show hrs.